Fairview introduces a green winelands transport alternative | Welcome to Fairview's Blog! After years of negotiation with local authorities Fairview have announced the launch of their latest greening initiative. 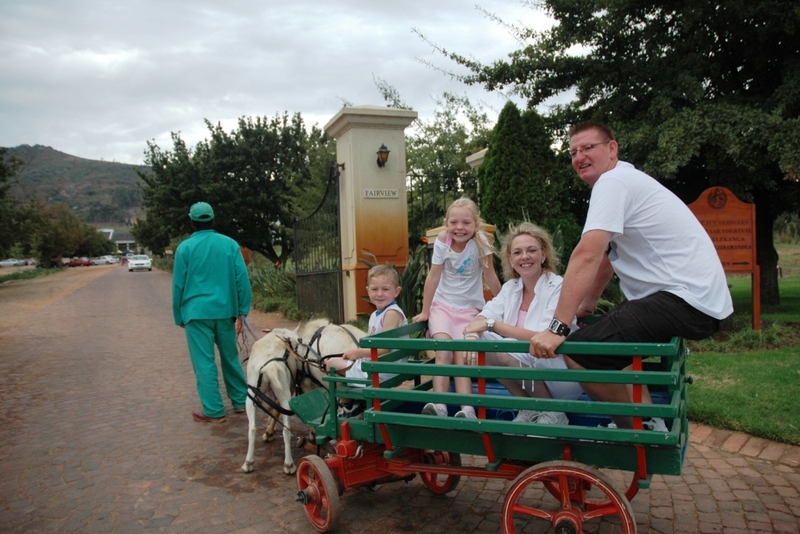 A goat wagon lane has been completed between Paarl Station and Fairview. Code name: the GRT – Goat Rapid Transit system. With the rising price of petrol and wine farms becoming increasingly focused on reducing their carbon footprint, this initiative presents numerous benefits to wine loving visitors and the environment alike. It aims to offer a safe and sustainable alternative for visitors travelling to the farm. Fairview currently attracts close to 250 000 visitors to its Paarl cellar door each year, most of which travel to the farm by car or bus. From today visitors and staff can take a train from Cape Town to Paarl station, from where the GRT will operate at regular intervals. Twenty-four custom-made wagons have been built by artisans from the Paarl region. “I am delighted to be involved in the revival of the art of wagon making in the area,” says Fairview owner Charles Back, “given the legacy of the art form in the region, previously known as Wamakersvallei (Wagonmakers Valley). Not only will this re-establish this historic industry, but it is also an opportunity for Fairview to utilize the unproductive goats in their 700-strong goat herd. “We will be making use of the billies and the does with smaller udders, as these are normally stronger than their high milk producing counterparts” added Back. Ongoing training has been conducted by farm manager Donald Mouton over the past couple of months. This has ensured that the goats are fit enough to pull the wagons and have become accustomed to the traffic on the road. Each wagon can transport two adults and two children and the journey from Paarl Station to Fairview takes approximately 34 minutes. Refreshments will be served on-wagon. What a great idea. Could you include bus fare from Bantry Bay to Cape Town Station in the package?